Above: Note how metal, like steel, can be cut with a CO2 laser or a YAG/Fiber laser. A lower power YAG/Fiber laser will have the same cutting capability as a higher power, measured in watts, CO2 laser. Traditionally, the CO2 laser costs less so it was more popular. Today, lower cost and higher power YAG/Fiber lasers are available and more buyers are purchasing metal cutting laser machinery. (See Kabir Series and Bristol Series). This section provides answers to frequently asked questions by prospective buyers of laser machinery. I want to laser cut/engrave metals and nonmetals. What machine do I buy? Lasers work on materials using the principle of absorption. In other words, the material must absorb the laser energy. Many different laser sources can and cannot work on materials.The power of the laser, measured in watts will affect the speed and depth a laser will work on a material. Fiber laser and YAG Laser and Diode Laser markers can mark or discolor the surface of metals, but generally do not cut. However, new advances in higher power markers enable them to cut very thin metals. ( See Cromwell Series ). There is an overlap in laser capability, so if you can estimate your needs now and in the future, then this will help you to select the best machine technology. For a chart and explanation of laser source capabilities see the Kabir Series . Can I mark metals with a CO2 Laser? Significant demand for laser marking metals by a CO2 laser machine has caused manufactures to create novel products. Look alike metals that look and feel like metal but are plastic are popular substitutes for brass, gold and silver--they are made by a company named Rowmark. 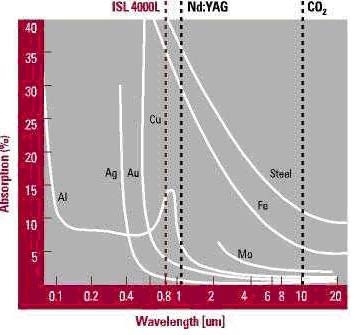 Ceramic coatings can be applied to metals, so that when the CO2 laser energy is abosrbed by them, they cure with a fine contrasting black mark. Cermark and Thermark are two popular brands. Other coatings or paints can be applied to create a reverse image by using the CO2 laser to ablate, or remove the coating. Cutting lasers, such as the Bristol Series, can discolor metals to produce a mark, but the quality is rough. For example, if the application is for use for internal numbering then it is adequate. The technology explanation is as follows. Cutting Lasers that are Fiber/YAG/Diode operate at an average power output of several hundred watts. Conversely, marking lasers operate at an extremely high peak power that is many thousands of watts but rest in between peak pulses. It is the peak power pulses of these markers that produce terrific contrasting marks. Is laser wattage the best way to compare lasers? Laser power, measured in watts, is a simple way to compare lasers. However, there are many additional technologies that affect cut speed and cut quality. Compare the material absorption chart to the laser sources. Differing absorption does not make a one-to-one comparison for differing laser source technologies. Why would I need a welded steel frame on my laser machine? You may not. The welded steel frame in the Kabir Precision Series increases accuracy and it good for laser machining. It is not necessary for many common applications like cutting and engraving acrylic. Why would I need a matched servo motor with amplifier? Can I cut one inch thick acrylic with the CO2 Laser? Cutting thicker materials is best done with a long length focal lens (rather than the standard focus lens that comes with the machine). Also, laser powers over 100 watts are recommended to reduce the heating of the acrylic and making for a faster cut. ( See the Options of Mica Series for Laser Head Upgrade ). Why are your laser machines lower cost that USA machines, yet higher cost than China direct machines? Our Chinese factory is managed by USA personnel. We "import" USA components then assemble in China, to provide you with the best value. Our technical support is provided in the United States. How do I know that a laser is good for my process/application/use? What factors affect the price of the laser machine? 1. Laser Source. The laser itself can be the most expensive item in the laser machine. 2. Machine Size. Larger machines can process larger jobs or hold bigger sheets of material. We find that buyers purchase additional lasers, after a year or so, that are larger and keep their original machines running smaller size jobs. 3. Machine Type. Welded steel frames provide higher accuracy due to rigidity. Matching servo motors with amplifiers provide higher speed processing at higher cost. Control systems to run these machines are more expensive than lighter duty control systems. 4. Laser Focus Heads. Optics and focus heads get the laser beam to the material. Higher quality has its price. How long will it require for me to learn how to use the laser machine? In general, the laser machine is simple to setup and run. Third party design software, such as Corel Draw or AutoCAD is used to make the design. These designs are downloaded to the laser machine that acts like a printer or pen plotter. What takes time can be adjusting the laser power, speed, and air pressure to get the ideal quality. Most materials are setup and go, but some are not and requiring an interative test process. A test pattern is best used that varies both laser power and speed, then examine the part to decide your best match. What utilities do I need to own a laser machine? For the Mica Series and BL Series CO2 lasers below 100 watts and the Cromwell Fiber Lasers and F Series a wall plug with 110 VAC and a 15 Amp circuit is adequate. Larger machines may require 220 VAC single phase or three phase power--as only found in industrial settings. An air compressor with clean dry air is recommended, or simply use the air pump that comes with the machine. Exhaust outside or inside if you purchase our filtration. See Upgrades . Local law compliance is the responsibility of the buyer. Will the BL-F series fiber laser mark our large electrical panels. - Will the 20 watt also cut aluminum, or does that require a higher wattage? If so, can the higher wattage laser also do marking? - Is the fiber laser also capable of cutting and marking Lexan? - Is the fiber laser capable of marking/cutting zinc-plated carbon steel? - Do you have another product that might suit our needs better. Would like to get a 48" x 32" size. For the fiber laser, there are two types or two technologies that have different capabilities. One type is called a fiber laser marker. This fiber laser is typically sold as a 10 or 20 watt laser. But it is Q switched (and that is the technology difference). The Q switching is a technique whereby the laser is internally delayed so that it builds up a huge, and I mean huge, amount of power, then let loose. When released the pulsed output power for the 10 watt is 6 kilowatts, or 6000 watts. For the 20 watt laser, it is about 12,000 watts. The result is that the average power drops to about 1-2 watts, but the pulsed power is 6-12 KW. When 6-12KW hits aluminum 6061 it discolors on the surface and gives you a nice brown or black contrasting mark. In summary, this is the technology used for fiber laser marking. Pricewise, a typical laser marker sells for $20-$30K and marks an area of 4 inches square or so. The second technology for fiber lasers is continuous wave, or CW, fiber lasers. For cutting aluminum at a quarter inch, these machines have an average power of 1,000-2,000 watts. The CW power is needed to heat up and penetrate solid metals. These machines are priced at $250,000 - $800,000. Lexan is a brand name. The industry name is polycarbonate. The fiber laser will pass through the lexan, similar to a light passing through glass. The technology reason is that the fiber laser has a wavelength that passes through nonmetals. In general a fiber laser will not cut nor mark clear plastics or wood. To mark your panels, you apply a spray coating named Cermark. Cermark is a ceramic coating that has been tested in outdoor accelerated harsh environmental tests and passed. It cures to a thickness of a few microns. You use the CO2 laser to cure it. For cutting thin carbon steels, this laser will do it. For the zinc coating, it should be fine. For nonmetals work, such as engraving plastics and cutting plastics, the CO2 laser can do that directly, without the need for Cermark. The technology reason for this is that the CO2 laser operates at a different wavelength from the fiber/YAG/diode lasers. The CO2 laser operates at a wavelength that is ten times longer, so that these materials absorb the laser energy, for the most part, rather than transmit or reflect it.